Famous Dave's is Chicago's Premier BBQ Caterer! Looking for delicious barbecue for your special event? We're here for you, with the perfect food to complement your carefully planned wedding, office party or family reunion. Whether you're serving 6 people or 600, our expert pitmasters and staff will ensure your special event is actually truly special. We don't confine our menu to the most traditional options, either. We also offer soups and salads for the lighter appetites, vegetarian sandwiches and burgers, and a huge array of appetizers. Think nachos or salmon spread, catfish fingers and onion strings. Anything you associate with a good old-fashioned time, we can provide, from bread pudding to brownies with a landslide of toppings. Okay, we're kidding. But still, a heaping helping of barbecue goodness certainly makes a big turnout more likely. Do birthday parties, golden anniversaries, engagement parties and retirement sendoffs in style now. Just let us know what you need, and we'll craft a menu to please every palate today. Holiday festivities, big anniversaries, mergers any other special dates all deserve celebration. Throwing a great office party can be tricky, though. Knitting together different tastes, different personalities and different dietary needs can prove to be a challenge, but here at Famous Dave's it's a challenge we're up to. For kids 10 and under we offer the Piggy Party Pack that serves 8-10. Choose from Chicken Tenders or Mini Corn Dogs with your choice of two sides, Oreo Cookies and lemonade. Serving around 8-10 guests you get 2 Whole Roasted Chickens, 2 pounds of our delicious Texas Beef Brisket, Georgia Chopped Pork, Hot Link Sausage and a loaf of Texas Bread! Got a big guest list? Our BBQ Blowout bundle serves 18-20 people. It comes with Mild Chicken Wings, St. Louis-Style Spareribs, Georgia Chopped Pork, Buns, Wilbur Beans, and our delightfully Creamy Coleslaw. Call us to plan the perfect menu, and we'll give you a firm price depending on your head count and selections. Leave the food to us. That way, you can turn your attention to planning the other aspects of your party. Budget-friendly and sanity-saving: That's Famous Dave's for you. 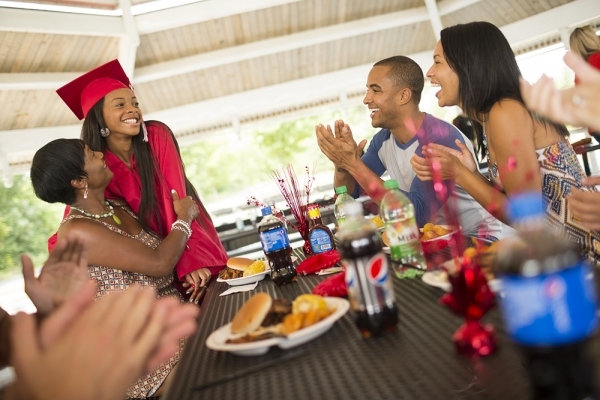 Celebrate your graduate in style with our huge range of barbecue options. Whether your loved one adores ribs or brisket, wants a Sloppy Joe or craves a veggie burger, we've got the goods. You can pick a menu perfectly tailored to their tastes, and please every other attendant at the same time. 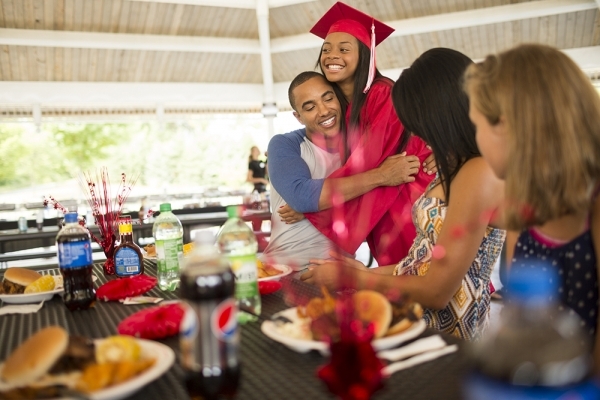 Set up your event in your home, a backyard, a park or a spiritual center. We provide you a variety of different food choices and also offer you help when it comes to deciding which will pair best together. Your guests will not go hungry - guaranteed! 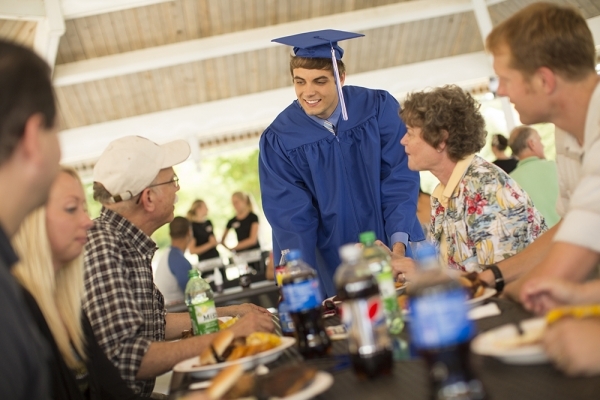 Leave the grub to us - now all you have to do is remember to order the cap and gown, and get the perfect present too. So, you want to tie the knot in style. Of course, you do, and one of the most important facets of any wedding is the food. 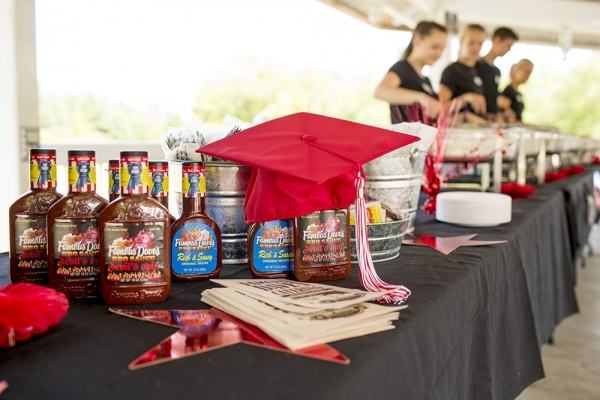 If you're looking for the perfect meal to complement a backyard wedding, in an old rustic barn, a Western-themed blowout or a lakeshore luau, our award-winning pitmasters will make sure it shine. Combine our expertly slow-roasted meats with our traditional sides and cold drinks, and watch your guests' faces light up. Be sure to taste our food ahead of time so you can perfect your menu and eliminate stress on the day-of. From appetizers following the ceremony to the big dinner to snack-ish items after the cake-cutting, we'll do it all just the way you want it, so call us today to learn more. Have another celebration coming up and don't see your function represented on this list? That's totally fine. We will hand-tailor a menu to any event, and serve a huge variety of locations in Chicago and the wider metro area. Plus, we believe in being honorable and accountable, and helping you stick to your budget. You can simply set your menu, give us a head count and get a firm quote, then go about your business without fear of changing prices or last-day expenses. Have other questions or needs? No problem. You can always come into our restaurant to sample the food and make sure it's for you, then ask one of our staff about next steps or just give us a call today. We can't wait to make your event as dope as it deserves to be. And while we might be biased, we think it all starts with barbecue. And we think, after you try what we have to offer here at Famous Dave's, you'll agree. Let's get to planning. Call us for a FREE CATERING QUOTE - we can't wait to work with you!